luis vidal + architects is an international architectural practice that provides high quality and innovative design led solutions to challenging projects. Since its establishment in 2004, this practice has opened offices across Spain, United Kingdom, Japan, United States, Chile and Dominican Republic and having built up a consistent career path expressed in more than 175 projects at different scales (urban planning, building and industrial design). 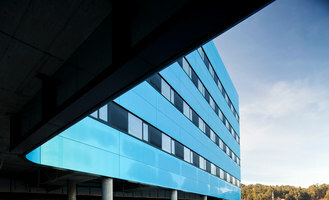 With an international workforce of over 100 architects with a strong background and solid experience in a wide range of disciplines, luis vidal + architects has become, not only an international benchmark in the design of aviation and healthcare buildings, but also a renowned practice with a great projection in the design of business parks. The practice’s transport architecture portfolio includes over 15 international airport projects, highlighting the 27 times international award-winning London Heathrow Terminal 2. Opened to passengers in 2014, it stands out for receiving the prestigious Air Transport World´ Airport of the Year Award (ATW) in 2015 and the World’s Best Public Building Award 2014-2015 (International Property Awards). It is also the first large terminal building to achieve a BREEAM Excellent rating for its sustainable design that reduces 40% of CO2 emissions. The firm´s philosophy relies on improving quality of life through design, focusing on the user as the starting point and main priority in all its projects. The firm is internationally recognized for enhancing “user’s experience”. Regardless of the scale, all projects in luis vidal + architects´ portfolio are born with the same DNA that defines its social, economic and environmental commitment. Luis Vidal studied architecture at the University of Greenwich (U.K.) and is a member of the Spanish Official Institute of Architects (COAM), the Royal Institute of British Architects (RIBA) and the American Institute of Architects (AIA). Just a year after establishing luis vidal + architects (LVA) in 2005 the practice was awarded the first prize at the International Competition for the new terminal building of Zaragoza Airport, a Mies Van der Rohe 2009 finalist and prize winner at the International Tourist Fair 2012 (Fitur) due to its AENOR Energy Efficiency Certificate. 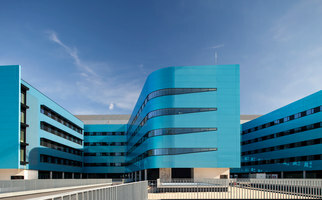 Since then, numerous projects have been awarded, such as the restaurant in Reina Sofia Museum (winner of the Architecture Prize of the City of Madrid for the Best Commercial Establishment), Can Misses Hospital in Ibiza (Property Award), and Álvaro Cunqueiro Hospital in Spain (awarded Future Health Project at the Design & Health International Awards and the first hospital in Europe designed following the BREEAM criteria). With Campus Palmas Altas (Seville, Spain) designed in co-authorship with RSHP, new standards in sustainable architecture were set. 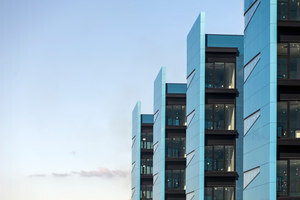 Abengoa’s headquarters became the first LEED Platinum in Europe and also the winner of RIBA Award 2010, Prime Property Award for Sustainable Development of Union Investment Group and Design Award in the Commercial category of American Institute of Architects in the UK. The internationalization of this practice was consolidated with the design of the new London Heathrow Terminal 2, “The Queen’s Terminal”, the second world’s busiest international airport. HM Queen Elizabeth II officially opened the terminal on the 23rd of June of 2014. Twenty million passengers per year, more than double the population of London, will travel through the airport annually. The main feature of this new terminal is that it is designed for the passenger, aiming to contribute to the experience of flying, and turning it into something pleasant. A space designed to meet all passengers’ needs, thanks to the implementation of a new combination of values such as the presence of natural light, the careful combination of color with prime attention to the richness of the textures that its´ materials convey, combined with a careful study of getting the acoustics right, were aimed to contribute in making a passenger friendly terminal with a core emphasis on intuitive way of finding. 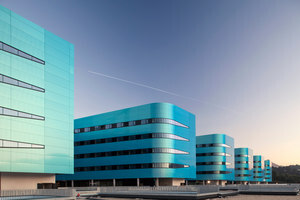 luis vidal + architects has developed a model for the hospital of the future, the “airport hospital”, typology based on its expertise in airports design and the use of “healing architecture” which gives priority to users and their well-being in opposition to the designs of massive dimensions. This model has crossed borders, and has been exported to other countries. In fact, luis vidal + architects has an active office in Santiago that has been named Best Healthcare Consultancy by the Chilean Ministry of Public Works (MOP). The firm has developed various hospital projects, including the ones in Quillota Petorca, Marga Marga, Chillán and Linares. In addition, luis vidal + architects has developed diverse projects of different scales in Chile prioritizing the preservation of the local culture and heritage. Some of the most recent works are the Palacio Schacht and the Community Health Center Matta Sur which has over 30,000 users. At present, luis vidal + architects is developing the foundations for a new transport architecture building: spaceports, becoming the first Spanish practice to design a spaceport ensuring its global recognition and experience in transport architecture. luis vidal + architects will be drafting the architectural concepts and design of the new Front Range Spaceport in Denver (Colorado, USA), as associated architects with the American engineering and architecture firm HDR. luis vidal + architects’ current airport commitments include designing the new Houston Ramp Control Tower (U.S.A.), the new International Comodoro Arturo Merino Benítez Airport in Santiago (in collaboration with ADPI); the Denver International Airport’s new design and development and the recently won bid for the design and architectural management of the Dallas Fort Worth International Airport terminal buildings, the fourth busiest airport in the United States, with over 64 million passengers travelling through the airport annually. In terms of renovation, the practice is always active. luis vidal + architects is currently working on the fit-out of the Hotel B&B Puerta del Sol located in the heart of Madrid; the LEED Platinum Pre-certified signature tower building in Castellana 77; the new façade and fit-out of the Eloy Gonzalo 10 offices -LEED Gold certified; the corporate spaces and public realm of Mutua Madrileña, and the fit-out for Ferroglobe headquarters in London. In addition, luis vidal + architects is working on the emblematic Botín Art Center in Santander, in co-authorship with Renzo Piano Building Workshop. Along with these projects in Spain, this practice is also leading two ambitious masterplans in Dominican Republic: Los Robles and the masterplan for Bávaro-Punta Cana, an area of 700 ha. focused on tourism, residential and commercial services. In addition, the practice is working on the Jones Plaza project in the Theater District in Houston (U.S.A.) and it is also designing the new campus of Loyola Andalucía University, the first private university in the Andalusian region (Spain).